DALLAS -- Dallas police say five officers were shot and killed and seven others wounded by sniper fire during a protest Thursday night against recent deadly police shootings. Two civilians were also shot. By early morning, a suspect was dead after a standoff with police in downtown Dallas, and three others were in custody, although police have revealed no details about their possible roles in the shooting. Dallas Mayor Mike Rawlings said that suspect died after officers used explosives to "blast him out." He was later identified as 25-year-old Micah Xavier Johnson. President Obama, who is at a NATO summit in Warsaw, Poland, told reporters the attack was "vicious, calculated and despicable." Investigators were sweeping downtown Dallas for possible explosives and combing the shooting scenes for evidence, including spent shell casings, CBS Dallas reported. Authorities said no explosives were found. Much of downtown Dallas was still considered a crime scene, Rawlings told reporters. Officials said many buildings there would be closed Friday and urged people to stay away from that part of the city. CBS Dallas points out it was the deadliest attack on police officers in the U.S. since 9/11. DART issued a statement saying, "As you can imagine, our hearts are broken. This is something that touches every part of our organization. We have received countless expressions of support and sympathy from around the world through the evening. We are grateful for every message. Thank you." DART identified its officers wounded in the shooting as Omar Cannon, 44, who joined DART PD in July 2009, Misty McBride, 32, who joined DART PD in March 2010, and Jesus Retana, 39, who joined DART PD April 2006. The snipers shot down at the officers from an "elevated position," Dallas police chief David Brown said in a statement. He raised the question of how the snipers knew the route of the protest in order to position themselves. "They planned to injure and kill as many law enforcement officers as they could," Chief Brown said. 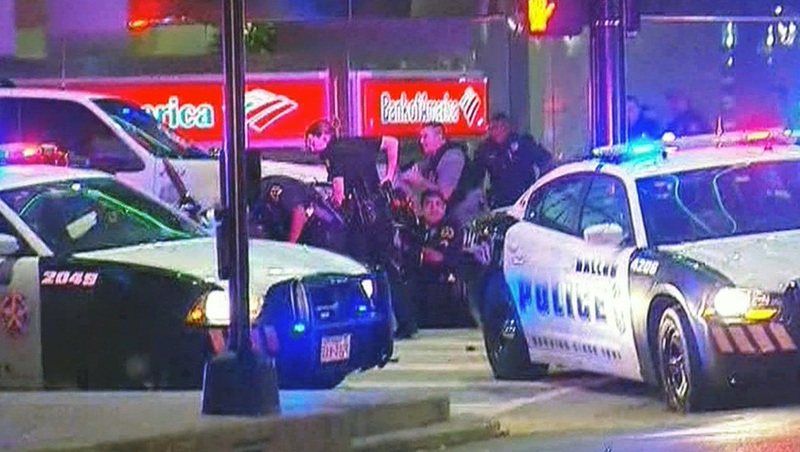 Dallas police conducted a massive mobilization in the downtown after the shootings, creating a massive crime scene. Buses and public transportation were shut down, stranding hundreds of people in downtown Dallas. Early Friday, Chief Brown said three subjects were in custody and that police were still in negotiations with a man with whom they exchanged gunfire in a downtown parking garage. That man said "the end is coming" and that he wanted to hurt police. The man also said there were bombs scattered around the downtown area. The police bomb squad was called to handle at least one suspicious package. Earlier, police tweeted a picture of a man who they said was a person of interest. That man turned himself in and was later released. Police also arrested two men in camouflage gear who were seen in the area in a Mercedes, after a brief chase. Chief Brown said they were concerned that there may be other suspects still at large. The shots were fired at at approximately 8:45 p.m. CST on Thursday night, as hundreds of demonstrators marched in downtown Dallas to protest recent police shootings in Minnesota and Louisiana. The Dallas protests were among numerous ones across the nation Thursday night -- in New York, Washington, D.C., Miami, Baton Rouge and other cities. "At first I thought (the gunfire) was a firecracker," one witness, Clarissa Myles, told CBS Dallas. "I knew it was a high caliber rifle, just from the pause and sound itself," anolther witness, Jamal Johnson, told the station. He described terrified protesters rushing to use a bus station for cover as shots rang out. He saikd he heard at least 30 shots." Another witness said it appeared the shots came from the roof of a parking garage. Earlier Thursday, in cities across the country, protesters pounded the pavement to express their heartbreak, fury and frustration over the shooting deaths of two black men, Alton Sterling and Philando Castile, this week. Video footage of both murders, shared widely on the internet, has helped narrow the emotional distance the American public usually feels in police shootings of black Americans. In St. Paul, Minnesota -- where Philando Castile was killed during a routine traffic stop with his girlfriend watching -- hundreds marched to the Governor's Mansion alongside the victim's mother, Valerie Castile, who is just one day into mourning her son's death, CBS Minneapolis affiliate WCCO reported. Minnesota Governor Mark Dayton has said that, in his opinion, police officers acted "way in excess" in shooting and killing Castile and would not have done so if he was white. The moment after Castile's shooting were captured by Castile's girlfriend, Lavisha Reynolds, who turned on Facebook's live streaming feature seconds after her boyfriend was shot and narrated the entire encounter to her personal network. In Baton Rouge, Louisiana, where Alton Sterling was shot, protesters gathered outside the Living Faith Christian Center with fists raised and chants on "No justice, no peace," according to CBS Baton Rouge affiliate WAFB. Louisiana Governor John Bel Edwards addressed protesters at a prayer vigil directly before the protest. In New York, approximately 1,000 demonstrators marched from Union Square to Times Square. In Washington, D.C., throngs of protesters gathered outside Capitol Hill and joined in song, swaying side to side to "We Shall Overcome." They chanted the now-familiar refrains: "Black lives matter" and "Hands up, don't shoot." In Chicago, one group of protesters gathered outside a South Side police headquarters before taking their rally to the Dan Ryan Expressway, where they blocked traffic for several minutes, CBS Chicago affiliate WBBM reported. Another group of demonstrators marched downtown and reportedly tried to take their protest into the city's popular "Taste of Chicago" event in Grant Park, WBBM reported.